3rd Bn. (King's County Militia). - Birr. 4th Bn. (Queen's County Militia).- Maryborough. 5th Bn. (Royal Meath Militia).- Drogheda. Majors attached to other Regiments, Special Reserve & Service Bn. 1st Bn. Dugan, Fra. Rogers, (Temp Lt.-Col.) commanding 7th Bn. 4th Bn (Extra Reserve) Maryborough, Ireland. 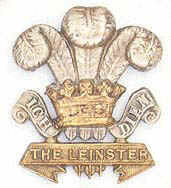 7th BN (Service) formed in Fermoy, Ireland in October.